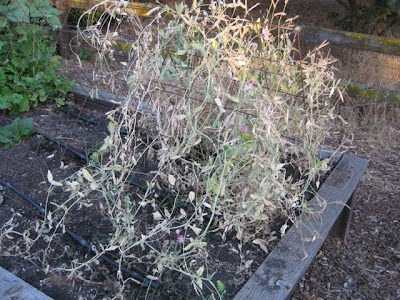 The Farmer Fred® Rant: Why Are the Blackberries Turning White? Why Are the Blackberries Turning White? From the garden e-mail bag, Teri asks: "What is wrong with my blackberries?" Dewey & Ann write: "What is causing this problem with my Chester blackberries? This is on the majority of them. I had it last year too. I checked with the local Hmongs and they also had it and said it was the 111 degrees we had in Oroville. We are at 2500 feet and 10 degrees cooler, but it wasn’t this hot last year. 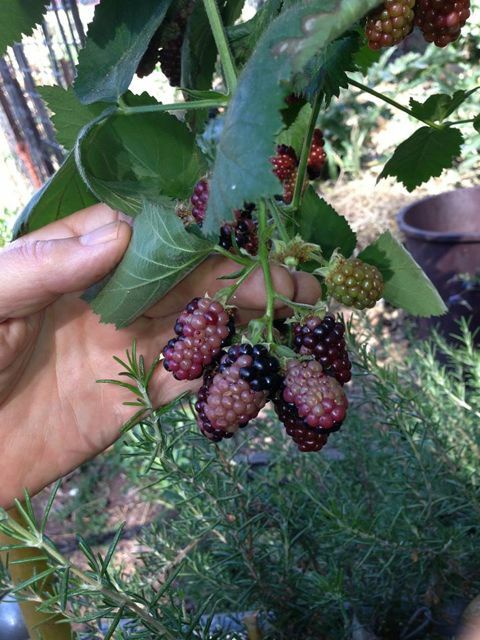 My Black Satin Blackberries were forming and doing well and I thought the problem was only with the Chester. Well, pretty soon I see it on them also. Am I missing something in our soil? It’s not on every one of them. It’s a dried seed eventually, but goes from a pink to beige and then worse if you don’t pick them. I would like to get to bottom of this. Can you help me?" Your local Hmong are wise gardeners. The recent week of very sunny 100+ temperatures, along with a couple of triple digit scorchers in the first week of June, could very well be the culprit. 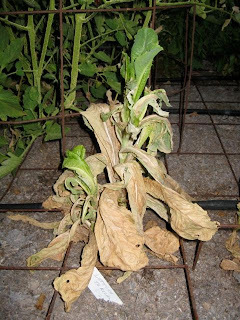 Even warm season vegetables that like sunlight, especially tomatoes, can be adversely effected by too much high intensity sun. 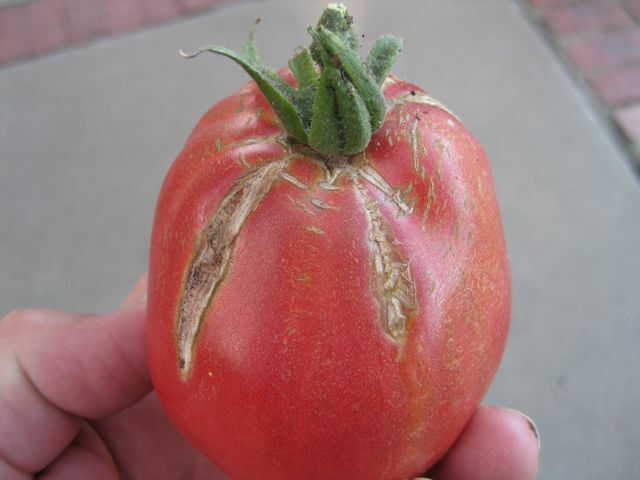 Abiotic disorders such as cracking, solar yellowing or green shoulders are common this time of year on young tomato crops. One remedy for that: don't prune off any of the leaf canopy of tomato plants; or, cover with a lightweight row cover to provide some more shade. 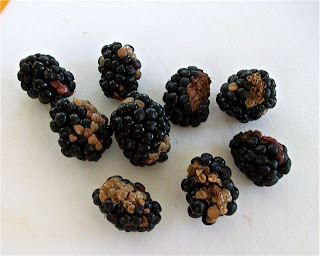 And now, you can add blackberries to the list of crops that develop problems when it gets too sunny, too hot, dry and windy, especially this year. The problem is known as White Drupelet. "White drupelet is a tan-to-white discoloration of one to many drupelets on the fruit. Most often, white drupelets will appear when there has been an abrupt increase in temperature accompanied by a drop in humidity; it is especially pronounced when there is wind. In the Monterey Bay area, white drupelet typically occurs when temperatures that are fairly steady around 70 degrees suddenly go above 90 degrees, and there is an absence of fog. Some growers of caneberries in the Willamette Valley of Oregon, where rapid changes from a normally mild climate to temperatures up to and above 100 degrees occur through the summer, use overhead irrigation to minimize fruit loss to white drupelet. 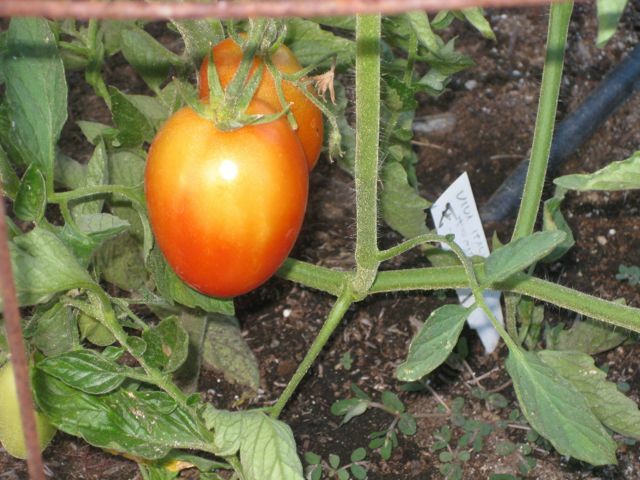 This is not merely to mist the fruit; instead, large amounts of water are applied to thoroughly wet the canopy and maintain cool temperatures and high canopy humidity for as long as possible. Sprinkling is not done too late in the evening to allow fruit to dry before nightfall. While some varieties, such as Apache blackberry, Kiowa blackberry, and Caroline red raspberry tend to get white drupelets more frequently than others, almost all caneberry varieties are susceptible to white drupelet to some degree." Hey, blame it on the weather. I have had this problem for the past 2 years and was sure it was me or some insect. Thanks for the explanation! The away around this problem? Plant early-ripening blackberries like the Arapaho! My second year plant delivered a nice harvest of large, juicy blackberries before the first heat wave of the season hit. When the heat finally did come on? The berries were long gone, already harvested, but the cane that will hold next year's berries loved every second of the high temps. It's now seven feet tall and lateral shoots are beginning to form.